Little River resident and Army combat veteran Justin Miller knows all too well the implications of PTSD, having served just over 11 years, including 27 months total in Iraq on two deployments. He says he deals with his situation a day at a time. 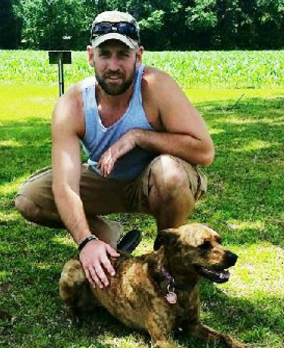 A major factor in his progress has come from his service dog, Bella – a 3-year-old Louisiana Catahoula Cur that was given to him by a friend who was stationed at Fort Stewart, Ga., because his friend was under the impression that Bella was a Pit Bull/Lab mix, and Pits are banned on post. “When I was in the process of getting medically retired, I was trying to get Bella certified as a service dog, but my retirement came nine months sooner than I was told and it didn’t end up getting finished, he said. But a fortuitous event came about at the Blue Crab Festival. While he was volunteering at his church’s booth [Renovation Church in Longs], an outfit called Big Paws Canine Foundation had a tent set up right next to him. Big Paws Canine Foundation [www.bigpawscanine.com] had recently opened up a location in Aynor, with existing branches in Southern California and Sioux Falls, S.D. She is – and after advising Miller of the things he needed to continue to work on with Bella and what would be involved on the test for certification, she passed and is now a bona fide service dog.